Gov. Jay Inslee has long advocated reducing greenhouse-gas emissions. But the state Legislature adjourned this month without taking the kind of major climate action desired by Inslee and his environmentalist allies. Even before Gov. Jay Inslee took office two-and-a-half years ago, some environmentalists were trumpeting him as “the greenest governor” in the country. In the run-up to the 2015 legislative session, Inslee — who’d built a reputation as a green-energy evangelist during his 15 years in Congress — seemed ready to live up to the title. In December, Inslee proposed an ambitious set of policies to cut greenhouse gases, anchored by a California-like cap-and-trade system that would impose what amounted to a new tax on carbon emissions by refineries, fuel distributors and other industries. He also floated a new rule requiring cleaner-burning fuels to cut tailpipe pollution. But after more than six months and three special sessions, the Legislature adjourned without taking the kind of major climate action desired by Inslee and his environmentalist allies. Even some smaller asks were rejected, such as closure of an oil-refinery tax break. That leaves Washington lagging in some ways behind other West Coast states and provinces that have enacted carbon pricing and clean-fuel regulations. And it’s led the Inslee administration to regroup and consider whether to take further action through executive order, a 2016 ballot initiative — or both. 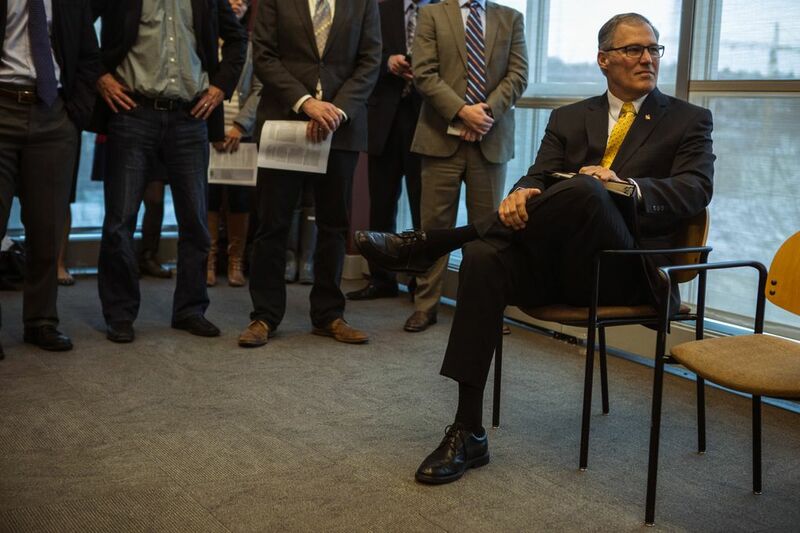 In a news conference, Inslee blamed the Republican-controlled state Senate, which included the top legislative recipients of oil and gas industry political donations. But the reality is more complicated, as Inslee’s signature cap-and-trade bill never even made it out of the Democratic-majority House due to concerns from some rural and moderate Democrats. “I think that means there is not a lot of support for his big tax on energy,” said state Sen. Doug Ericksen, R-Ferndale, a leading critic of the governor’s climate agenda. Late in the game, Inslee himself made a choice drawing criticism from some environmentalists. He pushed ahead with a highway-expanding $16 billion transportation package, accepting a “poison pill” provision that could hinder his administration’s plans to enact a new clean-fuels regulation. The Republican-backed provision would divert hundreds of millions of dollars away from transit, bicycling and walking projects if the Inslee administration tries to enact the cleaner fuels rule, known as a low-carbon fuel standard, by executive order. House Transportation Committee Chair Rep. Judy Clibborn, D-Mercer Island, who helped negotiate the transportation deal, said she was pleasantly surprised by Inslee’s decision. “I actually think it was a really brave thing. It made it possible for us to go forward,” she said. But Rep. Joe Fitzgibbon, D-Burien, who chairs the House Environment Committee, was not happy with the trade-off. “I think it’s an embarrassment for Washington that we have fallen behind our neighbors on this,” he said. California, British Columbia and Oregon have enacted low-carbon fuel standards. And Oregon Gov. Kate Brown this year essentially made the opposite choice from Inslee — resisting efforts to repeal that state’s clean-fuels law even though it led to the demise of a roads and transit package. Business groups heavily lobbied for the transportation package, funded by an 11.9-cent gas-tax increase. Inslee noted it had been a top priority of his since taking office. Patrick Mazza, an organizer with climate-action group 350 Seattle, which opposed the transportation deal, said despite Inslee’s climate views, he also was under immense pressure to make a deal. “All politicians are weather vanes, even the best of them. And the wind was blowing way harder from the business and shipping interests, from the labor interests who want those jobs, and from Sound Transit,” Mazza said. The transportation package authorized Sound Transit to ask area voters for a $15 billion light-rail expansion. Republicans initially had only offered partial funding. Ericksen, who voted against the gas-tax package, argues Inslee outplayed Republicans on the transportation deal. He said Inslee used the threat of a clean-fuel rule — which he believes was a tenuous proposition that would have faced legal challenges — to win full Sound Transit authorization. “He was able to use a weak hand and trade it for Sound Transit funding. That was the brilliant part,” Ericksen said. Inslee aides said given the divided Legislature, he never expected his climate agenda to pass intact this year. “The governor is an optimist but he is a realist,” Jamie Smith, an Inslee spokeswoman, said in an email. As for that “greenest governor” contest? Inslee’s aides have long pointed out he has not used the phrase. “The greenest governor thing means nothing to us,” Smith emailed. Smith also pointed to some wins on the governor’s environmental agenda. Among them: Lawmakers budgeted $40 million for the state’s Clean Energy Fund, which finances budding green technologies. Republicans initially proposed no money for the fund. The Legislature also extended tax incentives for electric cars, funded a low-income weatherization program and ocean acidification research. However, without a cap-and-trade system or other significant carbon-reducing measures, Washington is unlikely to hit greenhouse-gas targets in state law. The Legislature in 2008 set a goal of cutting emissions to 1990 levels by 2020, 25 percent below that by 2035, and to half of 1990 levels by 2050. 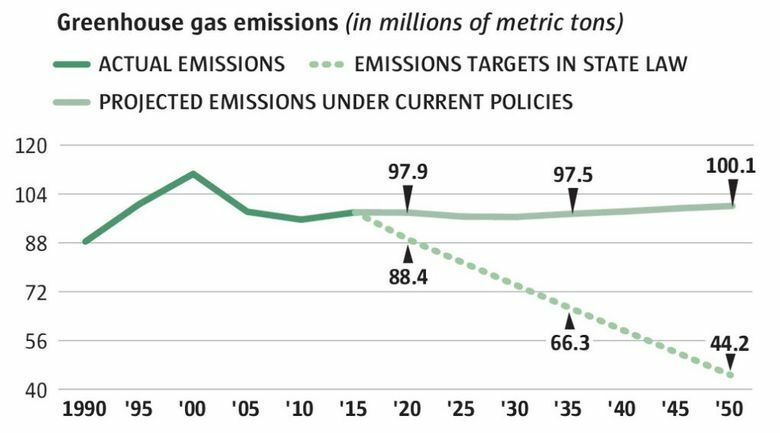 Meanwhile, Inslee has signaled the emissions goals in state law are not steep enough. Even as his cap-and-trade agenda stalled in the Legislature, Inslee in May signed on to a new international climate pact spearheaded by California Gov. Jerry Brown. The nonbinding “Under2MOU” calls for cutting greenhouse-gas emissions 80 to 95 percent below 1990 levels by 2050. A lawsuit against the state by a group of young climate activists contends Inslee could bypass the Legislature and impose such limits by executive order. But Inslee aides have said that’s not a realistic option. Environmentalist groups blame fierce lobbying by the oil industry for creating fear among Republicans and some more conservative Democrats that a cap-and-trade system or low-carbon fuel standard would lead to big spikes in gas and energy prices. Business and oil-industry groups have followed the same playbook up and down the West Coast, backing new organizations with names that sound like consumer or environmentalist groups to push back against climate regulations. In Washington, the Washington Climate Collaborative emerged in December to oppose Inslee’s climate proposals. “This is not easy stuff. There is very well-funded opposition,” said Adrienne Alvord, California and Western states director for the Union of Concerned Scientists. The Sightline Institute, a Seattle-based environmental think tank, tallied $3 million in lobbying and political donations directed at Washington politics last year by the oil, gas, and coal industries. Frank Holmes, regional director for the Western States Petroleum Association, rejected the notion the oil industry is halting climate proposals by itself. Environmentalist forces have also spent heavily in the state. Last year, California billionaire and climate activist Tom Steyer dropped $1 million here in an unsuccessful effort to give Democrats control of the state Senate. Todd Myers, environmental director with the conservative Washington Policy Center, said Inslee “keeps choosing the most partisan approach” and has only himself to blame for the lack of progress on climate policy. Myers favors a revenue-neutral carbon tax of the sort in place in Vancouver, B.C. That system gives back carbon-tax proceeds to the public in the form of other tax cuts. 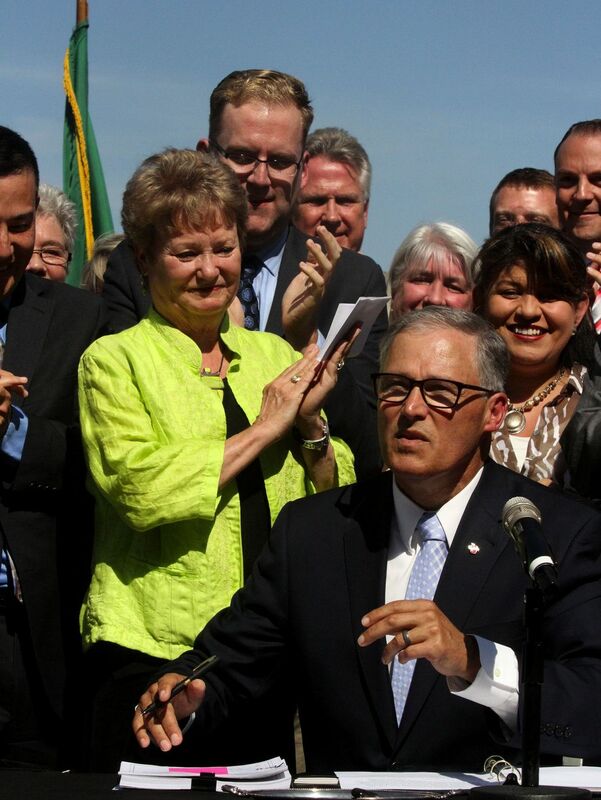 Inslee’s cap-and-trade plan would have raised $1 billion a year for the state budget. Inslee has continued to insist Washington will lock arms with other West Coast states on a united greenhouse-gas policy. In his post-session news conference, Inslee said absent “personnel changes” in the Senate, a cap-and-trade ballot initiative may be the solution. Fitzgibbon, the House environment chair, agreed. “I think initiative has always been a path that made sense on this issue,” he said. As the Legislature wound down a third special session this month, Inslee traveled to Toronto to deliver a speech at the Climate Summit of the Americas. There, he didn’t mention his legislative setbacks but warned of the dire threats of climate change and said Washington state still intends to put a price on carbon emissions. He noted some Washington-based space companies are now looking at exploration and settlement of Mars. “Colonizing Mars is great if it’s a choice, but not if it’s a necessity,” Inslee said.